Last week, I joined a group of food bloggers who are paying tribute to the Gourmet Live list of 50Women Game-Changers in the food world. On Fridays we each post a recipe we’ve completed from a woman on the list. 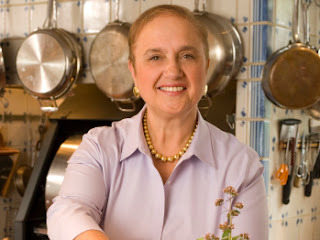 Today’s recipes feature chef Lidia Bastianich, who turned her Italian heritage into a food empire—cookbooks, television shows, restaurants, kitchenware, and recently, the new Eataly Italian food and wine marketplace in New York City. I have enjoyed watching Lidia’s television shows on PBS for many years. 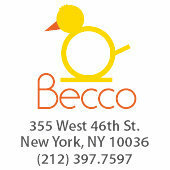 On my last trip to NYC, I enjoyed a wonderful meal at her restaurant, Becco. I was on my own, and sommelier Jeremy Ensey, who was filling in that evening as matra di’, made me feel comfortable and at home, with a table right next to the window. We chatted about the menu’s offerings and he made wine suggestions throughout my meal. I chose the Sinfonia di Paste, three pasta preparations that change daily and are served table side. I don’t remember completely what the dishes were—one had ribbons of pasta with fresh tomatoes and basil, and another had a duck confit sauce—but I do remember it was one of the best meals I’ve ever enjoyed. Jeremy even brought us both a lovely dessert wine at the end of the meal—on the house! (I wonder if he’s still there?) Now I’m looking forward to paying a visit to Lidia’s Italy in Kansas City very soon. I am grateful to Lidia Bastianich for one thing—getting me to stop using jarred sauces. By watching her on television, it was clear to see that making a fresh sauce can be done in no time at all, often while the pasta boils. I made her recipe for Gemelli with Sausage-Tomato Sauce, and over time adapted the sauce to fit my tastes. It is now my go-to sauce, as is her Neapolitan Pizza Sauce. Pizza is my absolute favorite food, and my adaptation of her sauce is the one I use each time I make it. This week, I decided to try her longer-cooking Simple Tomato Sauce. It was rich with a mellow tomato flavor—the perfect start to almost any Italian dish requiring a tomato sauce. I would have liked the dish even more with the addition of garlic and Italian seasonings, which I’ll try the next time. I could even see adding some oregano and using it on pizza. There is a large container of the sauce in my freezer, just waiting for me to get into an experimental mood. Heat the olive oil in a large skillet over medium heat. Crumble in the Italian sausage to brown. If sausage rendered a lot of fat, drain off the excess. Once sausage is browned, add the onions and salt, and continue to cook until onions soften. Add garlic, Italian seasoning, and red pepper flakes. Cook for 1 or 2 minutes to release the flavors. Add tomatoes. Lower the heat and allow sauce to simmer, stirring occasionally. Bring 6 quarts of salted water to a boil. Stir in the gemelli and cook until the pasta is done, 8 to 10 minutes. Remove the pasta from the boiling water and add to the sauce. Stir to coat the pasta and allow to cook in the sauce for a couple of minutes. Remove from the heat and stir in half of the cheese. Pour pasta onto a serving platter or individual bowls and top with remaining cheese. Mix all of the ingredients together in a medium bowl. Put chopped onion, carrot, and celery pieces in the food processor and pulse several times, until you have very finely chopped small shreds. Or chop the pieces by hand into tiny bits. Pour the oil into the sauce pot, stir in the chopped vegetables, and set over medium-high heat. Sprinkle on the salt. Cook for 3 minutes or so, stirring frequently, as the vegetables start to sizzle and soften; don’t let them brown. Pour the milled tomatoes and juices into the pan, and stir with the vegetables. Rinse out the bowl and the tomato cans with the water, and pour into the saucepan as well. Stir in the bay leaves, honey, and peperoncino, turn up the heat, cover, and bring the sauce to a boil, stirring and checking it frequently. Adjust the heat to maintain an active simmer, with lots of small bubbles all over the sauce. Cover, and cook for about 45 minutes, stirring occasionally. Remove the cover; raise the heat so the sauce is still bubbling energetically and gradually reducing. Cook for another hour or so, stirring frequently to make sure nothing’s sticking to the bottom of the pot. Turn down the heat as the sauce thickens (and if the bubbles are bursting out of the pot). Taste for salt near the end of cooking, and add more if needed. When the sauce has reduced by about a quarter and is concentrated but still pourable, remove from the heat. Let sauce cool; remove the bay leaves. Allow the flavors to mellow for an hour or two. Use however much sauce you need immediately; refrigerate or freeze the rest. Check out my fellow bloggers who also posted about Patricia Wells. There are some yummy recipes here! I only ever use jarred sauces in really dire situations, but especially now with these two recipes, I never will again! We have learned so much from these great ladies. I've always said I was a TV Gourmet--everything I've ever learned about cooking came mostly from television cooks! Joanne, I was the same way--jarred sauce in an emergency. My sweetheart likes the canned stuff, but I'm working on changing his mind. Lidia's simple tomato sauce just may be the answer!